In an previous study we found that Ulex parviflorus (Fabaceae) populations that inhabit in recurrently burn areas (HiFi populations) were more flammable than populations of this species growing in old-fields where the recruitment was independent of fire (NoFi populations) [1,2, 3]. That is, HiFi plants ignited quicker, burn slower, released more heat and had higher bulk density than NoFi plants. Thus, it appeared that repeated fires selected for individuals with higher flammability, and thus driving trait divergence among populations living in different fire regimes. These results were based on the study of plant flammability (phenotypic variability) without knowing whether plant flammability was genetically controlled. 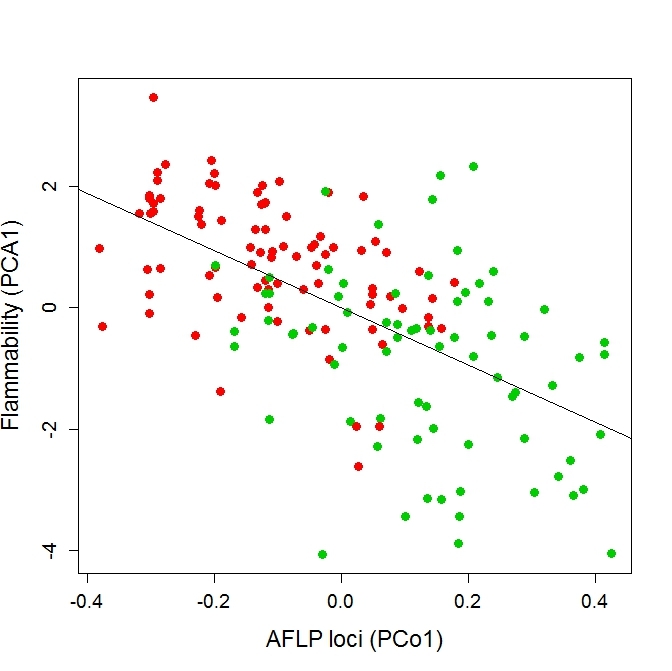 In a recent study using the same individuals , we show that phenotypic variability in flammability was correlated to genetic variability (estimated using AFLP loci) [figure below]. This result provide the first field evidence supporting that traits enhancing plant flammability have a genetic component and thus can be responding to natural selection driven by fire . 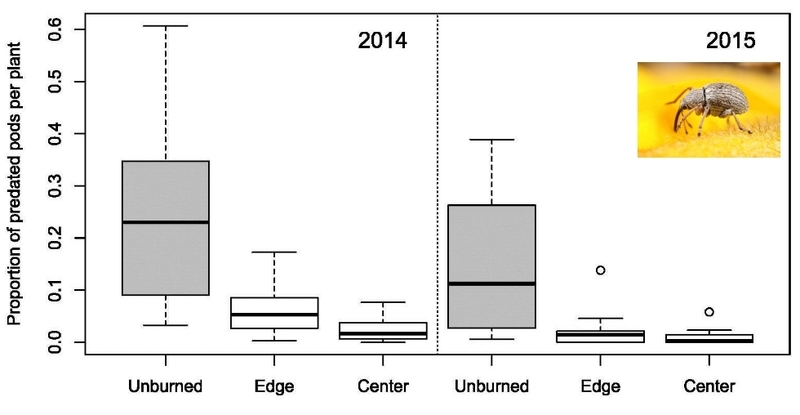 These results highlight the importance of flammability as an adaptive trait in fire-prone ecosystems. Figure: Relationship between flammability and genotypic variability at individual level in Ulex parviflorus (red symbols: individuals in HiFi populations; green symbols: individuals in NoFi populations). Variations in flammability are described using the first axis of a Principal Component Analysis (PCA1) performed from different flammability traits, and genetic variability is described using the first axis of a Principal Coordinate Analysis (PCo1) from the set of AFPL loci that were significantly related to flammability. See details in . Recurrent fires are a strong evolutionary pressure shaping plants [1,2]. It has been hypothesized that in fire prone-ecosystems, natural selection has favoured the development of traits that enhance flammability . Consistent with this idea, in a recent study  we found that Ulex parviflorus (Fabaceae) populations that inhabit in recurrently burn areas (HiFi populations) are more flammable than populations of this species growing in old-fields where the recruitment was independent of fire (NoFi populations). That is, HiFi plants ignite quicker, burn slower, release more heat and have higher bulk density than NoFi plants. Thus, it appears that repeated fires select for individuals with higher flammability, and thus driving trait divergence among populations living in different fire regimes. These results provide some field support for the ‘kill thy neighbour’ hypothesis , but they also highlighted the need for heritability studies to unambiguously demonstrate natural selection driven by fire. 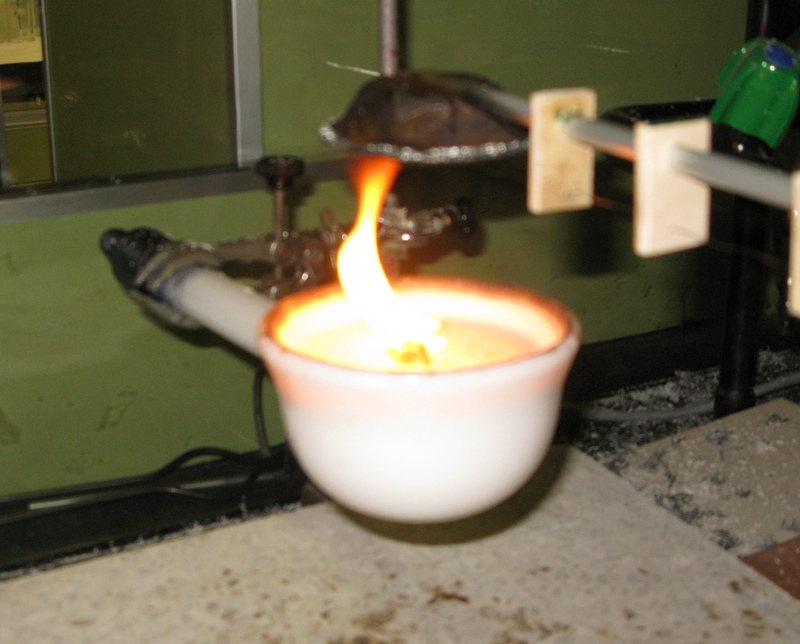 This study together with other studies recently commented in this blog [5, 6] are placing flammability as a fundamental trait in plant evolution. 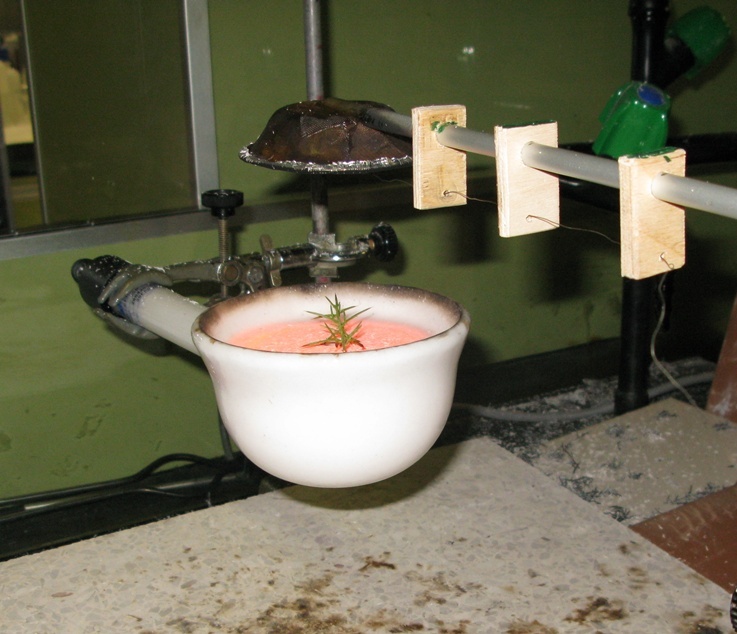 Figure: Flammability experiments using an epiradiator . Bond, W. J. and J. J. Midgley. 1995. Kill thy neighbour: an individualistic argument for the evolution of flammability. Oikos 73:79-85.